Video Highlights: Warriors defeat Cavaliers 108-97 in Game 4 (2016 NBA Finals) - Balita Boss! The Golden State Warriors are a game away from winning back-to-back titles as they defeated the Cleveland Cavaliers 108-97 in Game 4 of the 2016 NBA Finals. Golden State was paced by Stephen Curry with 38 points and Klay Thompson with 25 points. The Splash Brothers combined for 13 of Golden State's 17 three-pointers, which was a Finals record. 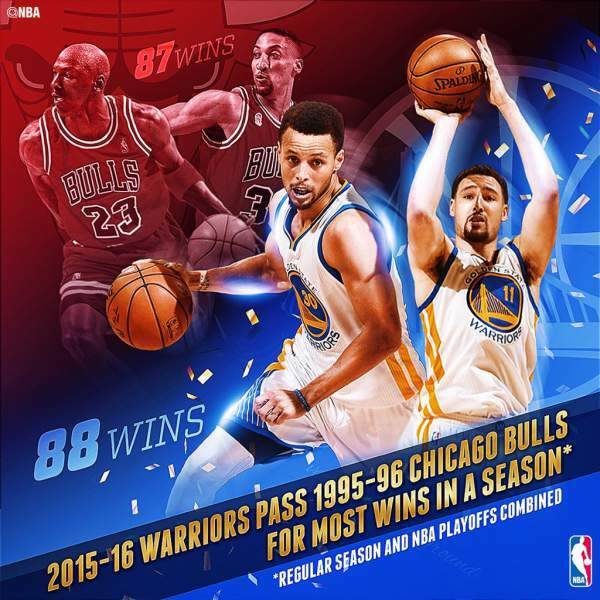 With the win, the Warriors recorded their 88th overall win this season, passing 1995-96 Chicago Bulls for most single season wins. Kyrie Irving with 34 points and LeBron James' 25 points, 13 rebounds and nine assists led Cleveland. The Golden State Warriors, with 3-1 lead in the NBA Finals, can close out the series in Game 5 at home at Oracle Arena on Monday (Tuesday in the Philippines). No team has ever come back from down 3–1 in an NBA Finals.